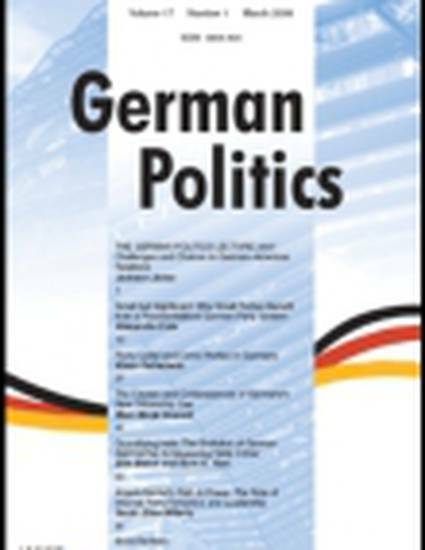 This article examines the role of small parties in the German party system. It thus attempts to make a contribution to a largely under-researched topic in the existing literature. The goal is to determine the influence and ultimately the pivotal role of small parties over time both federally and in each Land (1949–2010). For that purpose we develop a five-point ‘opportunity structure’ scale. During the heyday of West Germany's two-and-a-half-party system (from the early 1960s to the early 1980s) the FDP was not just the main small party but the pivotal kingmaker at least federally, deciding which of the major parties (CDU/CSU or SPD) would be in government. Since then the Greens and later the PDS/die Linke have also become durable small parties and play an important role in the government formation process. The analysis shows that based on our measure the Greens have at least equalled if not surpassed the FDP as the country's most influential small party since they emerged on the political scene in the early 1980s.